Wibu-Systems and Wincor Nixdorf expand their long-term collaboration and offer their respective expertise in the area of Digital Rights Management, IT services, and Service Desk solutions to the market. In times of industrial espionage, eavesdropping scandals, cyber-attacks and mysterious backdoors in routers and firewalls, endpoint encryption is crucial to protect business. 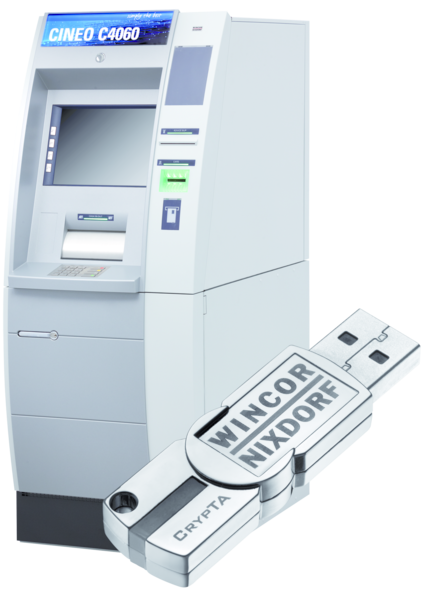 Since 2009, Wincor Nixdorf uses CrypTA (Cryptographic Technician Authentication) to ensure authorized access to test and diagnostic functions. This solution provides individual rights required in the working environment of each user and corresponding to his qualifications. "With CrypTA we are able to guarantee a high level of security to protect our intellectual property and can implement a high degree of flexibility in our processes at the same time," says Guido Walther, Director Technical Support at Wincor Nixdorf. CrypTA provides a mainly unrestricted, scalable platform that can be expanded modularly. Future security requirements, as well as new tools, can be integrated within the concept. Use of CrypTA secure flash memory sticks as "data collectors"
CodeMeter, Wibu-Systems’ core protection, licensing and security technology, is at the foundations of CrypTA. It features an aggregation of the most powerful encryption algorithms in combination with a smart card chip where the encryption keys are stored, away from all types of local and remote attacks. Its integration was seamless due to its intrinsic characteristic of implementation within ready-made solutions; such a factor is particularly appreciated in the manufacturing world, as it lowers the decisional and economic impact of the secured solution.